What Can Excel Do Without Macros? Watch this short video to see the steps, and the written instructions are below the video. If you use those built-in features, you might not need a macro. For example, instead of checking each cell in a column, and manually colouring the cell green if it's over 50, use conditional formatting to highlight the cells automatically. 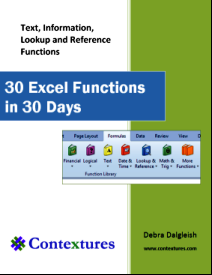 If you use Excel every day, you probably have a few tasks that you repeat daily, weekly or monthly. 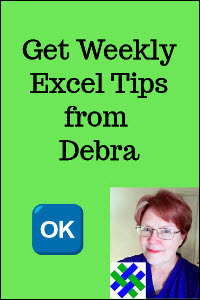 To get started with Excel VBA, you could focus on one of those tasks, and try to automate it. In this example, you have a list of stationery orders, in a workbook named Orders.xlsx. You can download the sample Orders file, or use a file of your own. Every day, in your imaginary job, you open that Orders file and filter the list of orders, to find all the orders for binders. Then you copy the orders, and paste them into a new workbook. Paste the binder orders into the new workbook. Instead of doing that task manually every day, you could automate it, by creating an Excel macro. Do you want the macro to open a specific workbook, or will that workbook already be open? Should you select a cell or worksheet before the macro runs, or will selecting the cell be part of the macro? 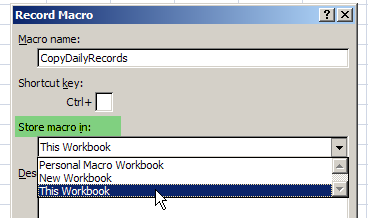 In this example, you want the macro to open the Orders workbook for you, and then filter and copy the data. So, the Orders workbook should be closed when you start recording. You don't need to select a specific cell or worksheet before recording; any cell selection will be done during the macro recording. Once everything is in position, you can get ready to start recording. Open a new blank workbook, which is where you'll store the macro. At the bottom left of the Excel window, click the Record Macro button. 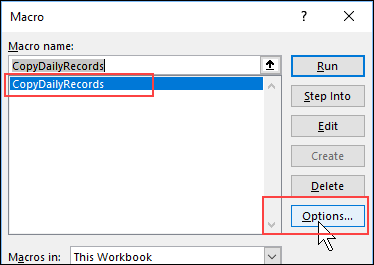 From the Store Macro In drop down, select This Workbook as the workbook where you'd like to store the VBA code. Later, you can open this workbook every morning, to run the macro. In the Description box, you can type a brief note about what the macro will do. This is optional, and you can leave the Description box empty, if you prefer. The Shortcut Key is also optional. Leave that empty for now, and you can create a shortcut later. Click OK, to start recording. Copy the filtered binder orders, including the heading row. Paste the binder orders into the new workbook, in cell A1 on Sheet1. If you make a mistake - no problem! Just stop the recording (instructions below), close the files without saving, and start over again. Once you finished all the steps, follow these steps to turn off the Macro Recorder and save the macro file. NOTE: When saving a file that contains macros, you must choose Binary (xlsb) or Macro-Enabled (xlsm) file format in the Save window. Click the Stop Recording button at the bottom left of the Excel window. Close the workbook where you pasted the binder orders, without saving the changes. To prepare to test the macro, make sure that the Orders.xlsx workbook is closed. To run the macro, you'll use the Developer tab on the Excel Ribbon. You can add the Developer tab to the Excel Ribbon, if it's not there already. Add a check mark beside Developer, in the list at the right. Click OK, to close the Excel Options window. Follow the steps in this video, to add the Developer tab in Excel 2010. On the Ribbon, click the Developer tab, and in the Code group, click Macro Security. If you changed the setting, close the workbook, and then reopen it. Open the file (BinderCode.xlsm) where you stored the macro that you recorded. If a security warning appears at the top of the worksheet, click the Options button. Click Enable This Content, to allow the workbook's macros to run, and click OK.
Now, follow these steps to run the macro, to see if it works the way you want. On the Ribbon, click the Developer tab, and in the Code group, click Macros. 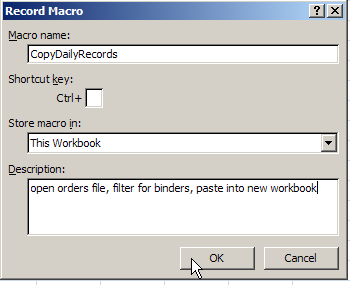 In the Macro dialog box, click the macro that you want to run - CopyDailyRecords. If you see an error message, click the End button, and try recording the macro again. If everything went as expected, great! You can close all 3 workbooks used by the macro, without saving the changes. To make it easier to run a macro, you can create a keyboard shortcut for it. 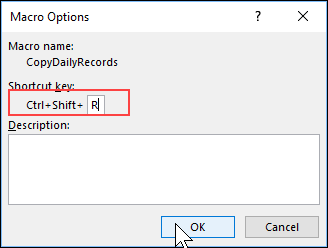 In the Macro dialog box, click the macro for which you want to create a shortcut- CopyDailyRecords. Press the Shift key, and type a letter to use for your shortcut --R in this example. NOTE: The Shift key is not required, but it's safer to use it, to avoid overwriting one of the built-in Excel shortcuts. To follow along with this tutorial, download the sample Orders file, or use a file of your own. The sample file is in Excel 2007 format, and is zipped.